Vampiric brawls at 30,000 feet, blasting helicopters out of the sky with homemade bazoookas, and exploding priests, oh my! How could you not like this show? Based on the Preacher monthly sequential narrative (comic for the laymen) by Garth Ennis & Steve Dillion and published under DC’s mature Vertigo imprint, AMC’s new supernatural drama has a storied pedigree. Join and discover (or enjoy the retelling) the strange world of Jesse Custer, Cassidy, and Tulip in the Pilot episode. 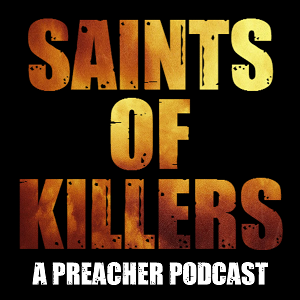 Music: This episode features clips of a song featured in the pilot, The Bible or the Gun by Blues Saraceno!